Personalized Double Line Border Estate Address Plaque - - one line or two line estate-size 22.25" x 9.5" traditional rectangle sign with clean double-line border. Made in USA. Alumi-Shield protective coating produces a durable and beautiful finish that will protect your address plaque against harsh weather and environmental elements. Shown in small images from left to right: AB antique brass, AC antique copper; BG black with gold characters; BS black with silver characters; BW black with white characters; GG green with gold characters; OB oil rubbed bronze; OG bronze with gold characters; RG red with gold characters; and WG white with gold characters. 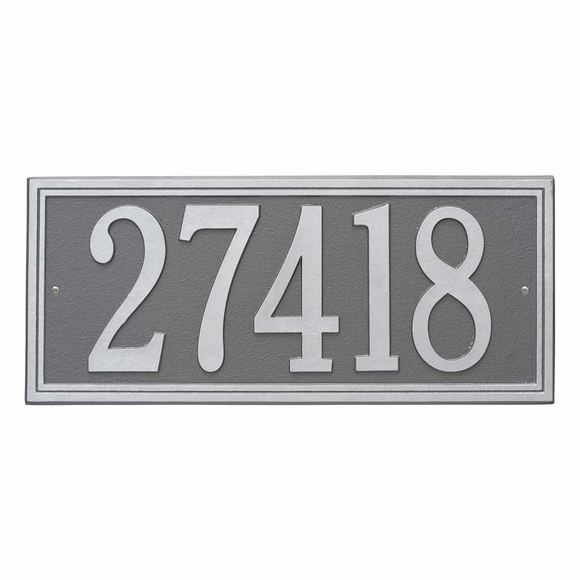 Double line border personalized address plaque for wall mount or lawn placement. Also available in a smaller 13" wide size (see Related Products).